“Over near Chancellorsville, where the whipporwills began calling plaintively soon after sunset, now as then, the mood was much the same. The fighting had been heaviest around here last year, and there still were many signs of it, including skeletons in rotted blue, washed partly out of their shallow graves by the rains of the past winter. No one but the devil himself would choose such ground for a field of battle, veterans said; the devil and old man Lee. The Battle of the Wilderness was the first confrontation between Ulysses S. Grant and Robert E. Lee. It was the beginning of a grueling campaign that lasted six weeks. Instead of confronting Lee directly, as his predecessors had attempted with disastrous results, Grant began a series of side-steps to force Lee to defend Petersburg, Richmond’s main supply base. This strategy required an iron will. Lee first forced Grant to fight in the tangled woods of the Wilderness, treacherous terrain that favored the defenders. 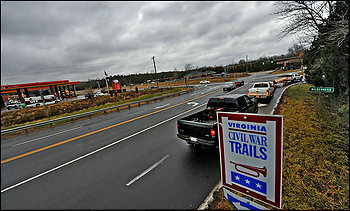 It was the place where Lee had inflicted huge casualties on the Union army one year earlier, in the Battle of Chancellorsville. Grant did not back down: “If any opportunity presents itself for pitching into a part of Lee’s army, do so without giving time for disposition,” he told his subordinates. The battle began with Union General Hancock attacking from the right and whipping up on Confederate Gen. A.P. 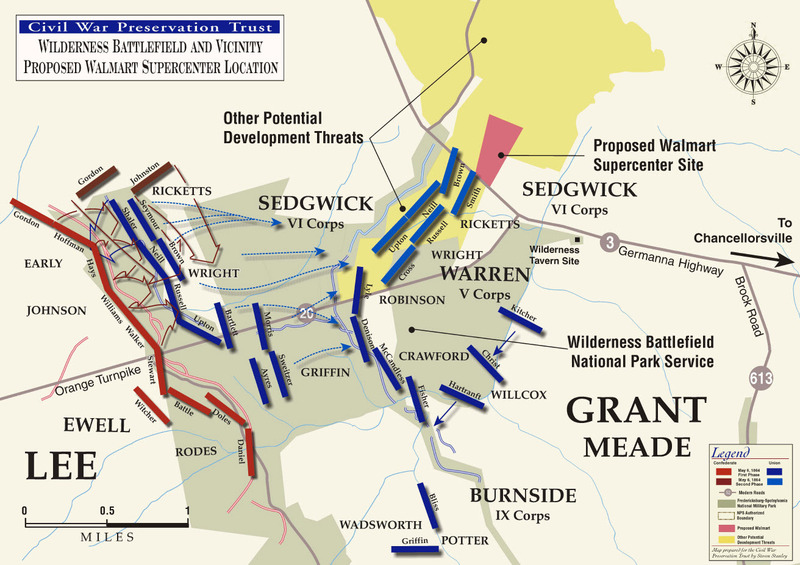 Hill’s forces, but a devastating counterattack led by General Longstreet seriously damaged Hancock’s men and forced them to retreat. All the while, a bloody stalemate raged on the Union left. When the fighting finally died down, a great brush fire raged through the forest, burning hundreds of wounded soldiers alive while the two armies witnessed their horrible fate. 7,500 Confederate soldiers were lost. Over 15,000 Union troops were killed or wounded. The fighting ended in a virtual draw; a tactical victory for the Confederates, but ultimately part of a strategically victorious campaign by the Army of the Potomac. Grant was not deterred by the losses, as every Union General had been before, and continued his bloody assault on the Confederate army, steadily moving to the left. With each move, Lee inflicted massive casualties, but Grant ignored his growing reputation as a “butcher” and proceeded stubbornly towards the Virginia cities that Lee could not fail to defend. When he began to threaten Petersburg, Lee had no choice but to occupy it. Grant then besieged Lee in Petersburg and ultimately forced his capitulation after forcing him out of the city and on the run. The Battle of the Wilderness is a vital chapter in the Civil War, and marked the beginning of a bloody campaign that the Union required three brutal years to steel itself for. Attempts to defeat Lee and his brilliant subordinates with a frontal assaults on their own terrain was a strategy that had repeatedly failed. An entrenched pattern of backing off after serious bloodshed was ruinous to Union war aims and morale. The only way to win the Civil War was to break Lee’s supply lines, while being able to stomach the massive casualties this task would require. Grant was the first leader of the Army of the Potomac with the stones to defeat the Army of Northern Virginia, and he announced his intentions to do so in the Wilderness. The battlefield is a monument to the most merciless fighting of the war; a place where the bitterest determination of both sides was put to a test. With all that said, doesn’t the battlefield sound like an awesome place to put a Walmart? To commemorate the bloody struggle, portions of the Wilderness — which is near Locust Grove, Va., in Orange County — were set aside as a national military park. However, just 21 percent of the battlefield is permanently protected; other key areas are privately held and vulnerable to development. “Wilderness Wal-Mart” supporters argue that because the proposed store site lies just beyond the park, it lacks historic significance, a profound misunderstanding of the nature of history. In the heat of battle, no unseen hand kept soldiers inside what would one day be a national park. Such boundaries are artificial, modern constructions shaped by external factors, and they have little bearing on what is or is not historic. To assume the park boundary at the Wilderness encompasses every acre of significant ground is to believe that the landscape beyond the borders of Yosemite National Park instantly ceases to be majestic. Many Civil War buffs and preservation supporters protested the development plans, including Virginia Governor Tim Kaine and the great Robert Duvall. To no avail, as the Orange County Board of Supervisors approved the permit for the Walmart on Tuesday, by a 4-1 vote. Coming soon, the Gettysburg Battlefield Home Depot. “Walmart doesn’t care about American history,” sneered the Atlantic’s Jeffrey Goldberg, and pointed out that after all, these are the same people who willingly decorate cakes for Nazis.